I’ve been sewing up roman blinds for my kitchen for the last week or so. Fully interlined and lined roman blinds are not exactly what I would call simple to make. I have two windows in my kitchen, one is small (36″x34″) and the one pictured above is large (54″x61″). The large one faces almost due West, and in the summer it is extremely hot on that side of the house, as you can imagine. We can literally cook eggs on the metal frame outside the window. So I wanted interlined blinds to help keep the heat at bay. I have a couple of great books for sewing home decor that I referred to, but I really wanted a step-by-step tutorial, and found this little beauty at Sew-Helpful.com which laid everything out, including a fabric calculator to the nearest half-centimetre. This was the first time making fully interlined roman blinds, and with the help of a friend and constant references to the online tute, I made these up. I’ll confess that the small one was much easier to do than the large one, and yet I still had to re-do parts of it because I’m not a home dec expert. The quote I was given to have these blinds sewn up professionally was $1500 + tax, which was a little out of our budget, to say the least. 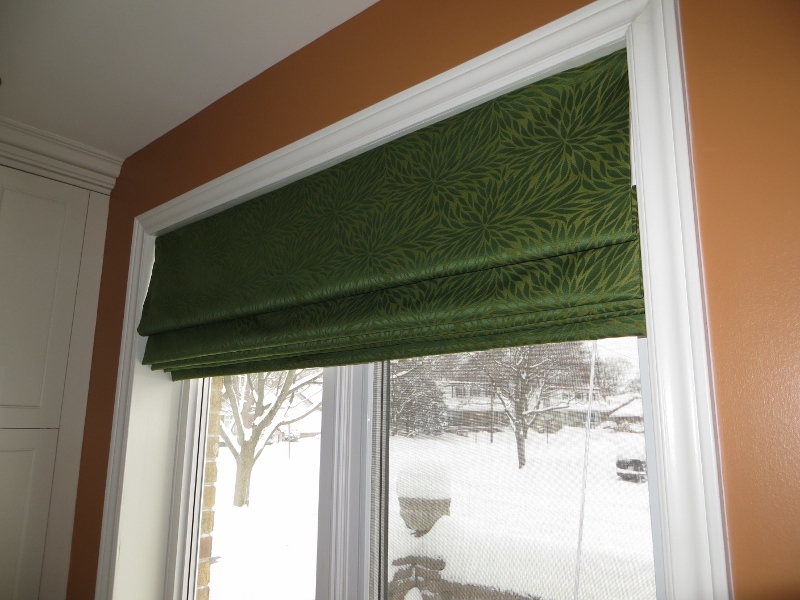 After reading posts on Stitcher’s Guild and wandering down the linked rabbit trails, I discovered that custom roman blinds are high-priced because there is a lot of hand sewing involved. Let me just tell you, that is 100% true, and I now understand completely why the quote was so expensive. The only part of these blinds that are machine stitched are the channels for the 5mm rods and the velcro tape at the top edge. E.v.e.r.y.t.h.i.n.g. else is hand stitched. 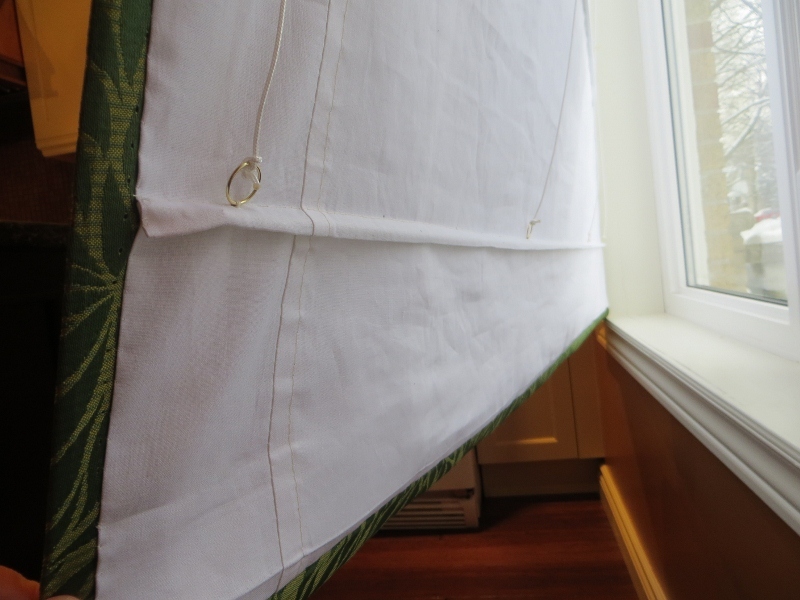 One of the conundrums was the width of the large window, as I wasn’t sure the fabric was wide enough to do the blind without joining widths. I bought enough fabric thinking I would have to join widths, but when the bolt arrived, I was pleasantly surprised to realize I could cheat a little on the sides’ turn allowance and not join widths. I actually had enough left to have a cushion made up for the front entry way because of this little (2 cm wide) cheat on the sides. 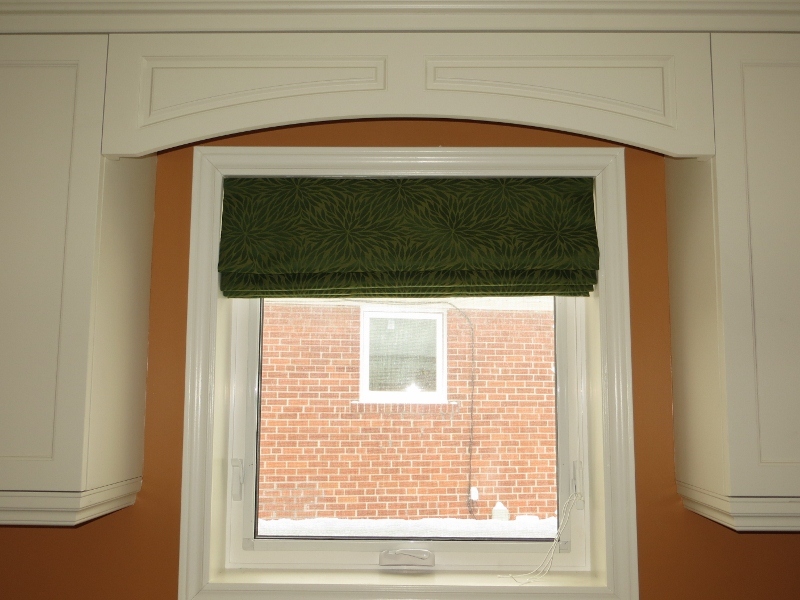 I’ll admit to redoing a few turning allowances more than once on both blinds, and that the large one is not 100% custom-made perfect, but I’m pleased with them, and have a tremendous amount of respect for custom drapery costs. I do have interlined drapes that need to be done (eventually) for my living room, and I’ll just say that I am going to be quite pleased to pay the cost for excellent custom work when the time comes. Ok all, go to MFay.com and order her Roman shade pattern. Almost no sewing and if you get yourself a little ring gun from Rowley or another Home Dec supplier you can make a shade in under an hour! Thanks, Linda! I had a quick look at the website you suggested – great patterns! None would have worked for me as I needed interlined lined shades, but this is a great resource! Thanks for commenting. Those are beautiful!!! 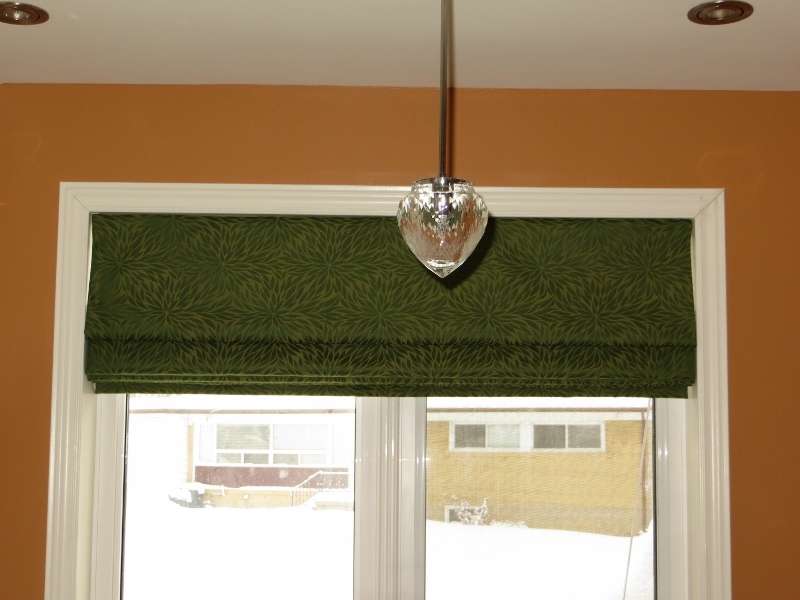 I’ve made roman shades before, along with 3 sets of matching pleat drapes. Drudgery for sure, but I can’t part with the $$$ to buy custom. Your blind look so professional! I’ve only tried to make one once. And no matter how careful I did the calculations, the folds never came out the right size. I also had lots of problem with the blind not wanting to fold up nicely when you pull it up. I always have to guide the folds into place by hand. I wonder what is the secret ingredient to ensuring the folds form tidily without manual intervention. I actually used the online calculator at http://www.sew-helpful.com to get the folds looking the same (they are not 100% accurate, BTW). As for the folds falling into place without help, apparently letting them sit in the pulled-up position for the first 48 hours of their hanging life helps the folds fall into place more easily. They did turn out great and lovely rich colour too. Who knew so much hand sewing would be required – I hope it was of the sort you could chill out and do? Wear it!! Sew something up and wear it! I’m sitting in the study where I have a roman blind 66″ wide which required a centre seam and pattern matching. My curtain lady refused to do it because she could never charge for the amount of time that it would take to make it! She did come here to help me hang it. The thing I found the most time consuming was the measuring and cross-checking as a roman blind really needs precision. I made the blind nearly 20 years ago and often admire it, telling myself that if I can do that then I can do anything! With my knowledge I really appreciate your achievement. Well done and do enjoy the results of your efforts. Thanks so much for your words of encouragement! I agree that roman blinds are a long project, especially because of the constant measuring. I really love the colour of the blinds, and enjoy looking at them. Sorry, my comment was anonymous, and I hate that! Beautiful blinds! I actually love this kind of job and it’s really rewarding. Earning 1500 dollars minus your material costs for a week of handsewing? Anytime! I think these turned out great. You should be able to tackle your living room drapes because they won’t have so much hand sewing. The view from my windows in Indiana is just like yours, all snow covered.